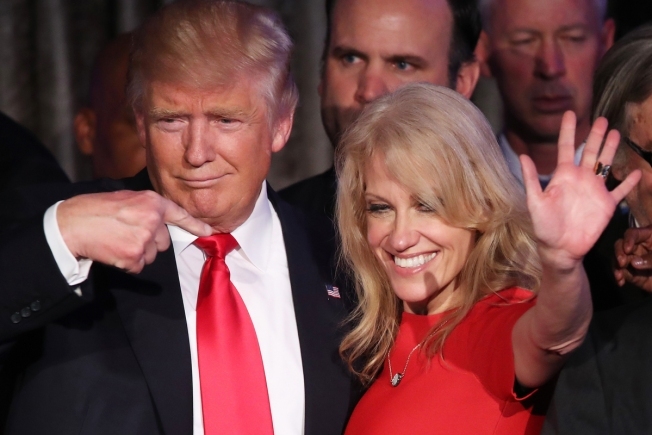 President Donald Trump and Kellyanne Conway on election night. A top aide to President Donald Trump has cited a 2011 "massacre" in Kentucky that never happened as a reason why the administration's temporary ban on immigration from seven Muslim-majority nations is necessary. During an interview with MSNBC's Chris Matthews that aired Thursday, Kellyanne Conway defended Trump's executive order on immigration last week by saying that former President Barack Obama instituted a similar policy for Iraqi refugees in 2011. "President Obama had a six-month ban on the Iraqi refugee program after two Iraqis came here to this country, were radicalized, and they were the masterminds between the Bowling Green massacre. Most people don't know that because it didn't get covered," Conway said. Conway is referring to a tightening of security checks for entry into the U.S. after the May 2011 arrest of two men on charges of plotting to send weapons and money to al-Qaida operatives waging an insurgency in their native Iraq. Waad Ramadan Alwan and Mohanad Shareef Hammadi, were mistakenly admitted to the U.S. as Iraqi refugees in 2009 and resettled in Bowling Green, Kentucky. On Twitter Friday morning, Conway said she was referring to the two men arrested in Kentucky and meant to call them terrorists. "On @hardball @NBCNews @MSNBC I meant to say "Bowling Green terrorists" as reported here," she wrote and included a 2013 article that mentioned the two men. Calling the Obama administration's actions a "ban" on Iraqi refugees is misleading. A formal ban wasn't announced by that administration, though there was a dramatic decline in the number of Iraqis allowed to move the U.S. in 2011. Officials at the time cited an enhanced security clearance process for delaying Iraqi visa applications. Shortly after Conway's comment, a parody website soliciting donations for the "victims and families directly affected by the" now famous fake tragedy was established. "We all still carry the vivid memories of what horrors occurred at Bowling Green, but some still relive those moments everyday as they work to rebuild a community torn apart," a quote on The Bowling Green Massacre Victims Fund site states. While it is unclear who or what group is behind the website, visitors attempting to make donations are redirected to the American Civil Liberties Union (ACLU) donation page. Following Trump's immigration order, the ACLU has seen a surge in donations and memberships. Conway's comments have also made fodder for jokes among social media users. "Bowling Green massacre" quickly became a top trending topic on Twitter with a flurry of tweets mourning the nonexistent victims. The mayor of Bowling Green, Bruce Wilkerson, said in a statement Friday that he appreciated Conway's clarification and understands live-TV interviews can lead to mishaps. “I understand during a live interview how one can misspeak and we appreciate the clarification,” he said.